For juveniles who have been serving a life sentence, release from prison is a welcome but daunting day. Zias is part of a collaborative initiative to better prepare people upon release from prison. The goal is to stop what can be a revolving door. 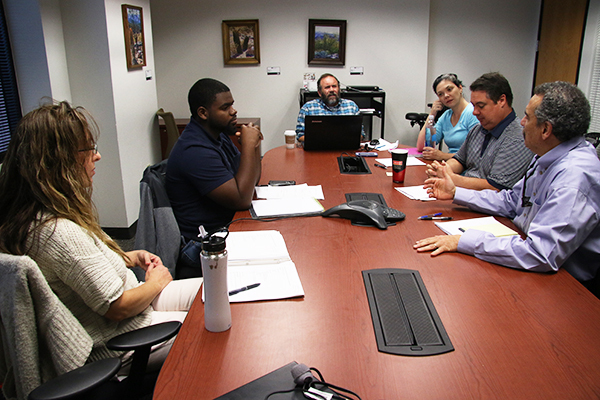 Building on an existing partnership between the Sandra Day O’Connor College of Law and the Arizona Justice Project, this year social work students joined a team of post-conviction lawyers to bridge the gap between release and re-entry. The project was initiated by Jose Ashford, professor in the School of Social Work and director of the Office of Offender Diversion and Sentencing Solutions which employs research-practice collaborations to promote reform in the treatment of offenders in the justice system. “These are people who have spent years being told what to do and when. They don’t even have control over when to turn on and off the lights,” said Rachel Williams, who is pursuing a degree in public service and public policy with a concentration in social services delivery. The team has several clients who are incarcerated, plus others who have been released. Without plans that realistically address potential risk factors, it is unlikely that the Arizona Board of Clemency would consider the inmates suitable candidates for release. Students learn to use holistic principles of defense and develop evidence-based support plans, along with a strategy for longer term community support. The team evaluates each client’s situation, including goals such as employment and housing. They are also the ‘eyes and ears’ for clients in prison, helping to research housing options, social services and provide a support system for those who may not have family support in place. “They are intelligent people but they have lost their confidence,” Reilly added, noting one client who was having trouble with employment. It was a simple matter of transportation. The team recently had the chance to put their plan to the test at a client’s clemency hearings. He had been in prison for 43 years, convicted of a murder that was committed by someone else. “We met with the client and using a bio-psycho-social approach, worked to figure out not only more about his social history but also identifying the things he would need if he were granted parole,” Lateef added. “Their expertise, and professor Ashford’s guidance, is invaluable and has been the missing piece of our work for a long time,” said Katie Puzauskas, supervising legal clinic attorney for the Post-Conviction Clinic in the Sandra Day O’Connor College of Law. The group said that in this case their client was fortunate to have a lot of support. He was granted house arrest. The re-entry team will continue to work with him. “This outcome probably would not have been achieved without the hard work of our students on designing a plan for release that assuaged the Board’s concerns about the offender’s future risk to the community,” Ashford said. To ensure continuity of services and reduce the learning gap that can happen, students starting their internship next semester will meet with interns this semester so that they can get familiar with the process. Current interns will also stay on for the next semester in a rolling format.